3 Phase Electrical Pan Mixers Robust Pan Mixers helps mix the aggregate, cement & water thoroughly & uniformly. A brick making machine is only as fast as your mix will allow you. Robust Pan Mixers ensure a constant availability of ready mix. 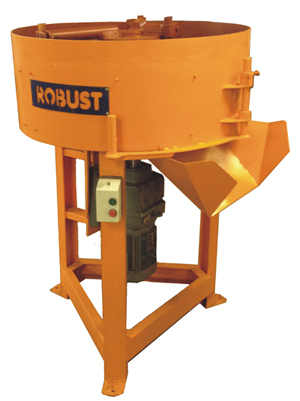 We have designed a Robust mixer to ensure a rapid supply of mixture. The Robust range of mixers all have wear plate linings that, can simply be replaced, together with the mixing paddle shoes, when worn. Our pan mixers operate on a robust, rapid mix cycle, designed for semi-dry mix as used in cement brick/paver/block manufacturing process. The 200 litre mixers can deliver around 35 cubic metres of mix per day (8hrs.) and the 300 litre , up to 55 cubic meters. With a minimum of about 60 sec per batch. Robust Pan Mixers come in 200 l , 300 l and 500 l.